Peace and quiet surrounds you. Waken in you cosy loft bed to the songbirds' serenade. Enjoy your self-prepared breakfast on the deck with freshly brewed coffee or tea. Coffee, tea, and cream will be supplied. Delight in some of Salt Spring's fine locally prepared cheese or fruit preserves, wholesome breads and farm fresh eggs that you can purchase at the Saturday Market, a roadside farmstand, or straight from the farm! Then make your way into Ganges Village to check out ArtCraft and to browse the local shops and galleries. Saturday morning is when Salt Spring hosts the famous Salt Spring Market. Be sure to treat yourself to lunch at one of the many unique restaurants and cafes. Don't forget to try some gelato at Harlan's! Grace Point Square is where you will find Lyman Whitaker's Windsculptures. These mesmerizing works of art are available in Canada exclusively throughyour host, Matt, at Steffich Fine Art in Grace Point Square. If adventure is on your mind, check out fishing, scuba diving, kayaking, whale watching, biking, or hiking. Take a Studio Tour. Go on a boat tour or dinner cruise. Explore Salt Spring's history or just relax at one of the many beaches, lakes and parks. Keywords: Vacation, rental, accommodation, holiday, salt spring, saltspring island, cottage, loft, budget, adventure, dog-friendly, pet-friendly, self-contained, self-catered, bed and breakfast, ocean view, patio, deck, BBQ, wi-fi, Internet, satellite tv, DVD player, tv. Matt and I are long time islanders. Matt has lived on Salt Spring for 27 years after having vacationed here every summer since 1968. I have lived here for most of my life. My family roots go back to the 1930's and 40's when my great-grandparents farmed on the north end of the island, boating their produce around the 'Hook' to Ganges every Saturday during the summer - the original Salt Spring Farmer's Market! We are proud parents of 2 fantastic boys and loving owners of Hank, the Golden Retriever. Matt is the owner of Steffich Fine Art and I am the pharmacy manager at Downtown Pharmasave. Matt and I have travelled extensively to Australia, Mexico, and the USA, and we have spent many vacations exploring BC and Vancouver Island. Having stayed in a wide variety of accommodations we realized that simple and relaxed, private and convenient, comfortable and casual were the most appealing features of our vacation accommodations. As dog people, we really appreciate being able to travel with our dog. He is an important part of our family and travelling without him would be like leaving one of the kids at home! In 2010 we made a decision to share our cabin as a vacation rental so others could come and discover the magic that is Salt Spring Island. The cabin was just a sleeping cabin when we bought the house in 2002. Our friend, Jeremiah Hart, moved into the cabin soon after and traded rent for renovations. Jeremiah lived in the cabin for 5 years and, with his masterful use of space and natural materials, transformed it into a lovely little self-contained cabin that is comfortable summer and winter. The main feature is the deck situated under a large apple tree where you can relax in the peace and quiet of the backyard orchard. The cabin is a short walk to shopping and restaurants in Ganges. Dog walking and hiking trails are easily accessed just steps from the cabin. Wine tours, boat cruises, parks, scenic drives, swimming lakes and beaches are a short drive away. Imaginatively laid out sink, toilet and shower. No tub. The view is from your private deck of the apple and plum trees in a quiet, bird-filled orchard. A 15 minute walk into the village of Ganges. 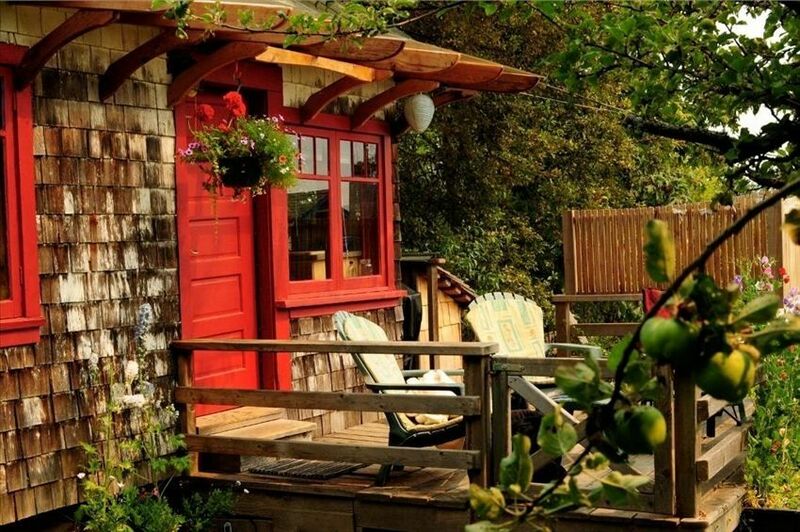 Cute little cabin on salt spring! We did not need to ask for anything as the cabin was fully stocked with all we needed. However, our hosts were available at all times if needed and very kind. Great value for all that you get, and our older dog was able to enjoy our trip with us so we couldn’t ask for more. Perfection. Exactly what I needed. Cozy cabin close to town! This was a lovely place to stay. Close to town, but overlooking a beautiful orchard. The word burning fire place is a huge plus and the loft bed is super comfy. It was great for our dog too. We could wander around the yard with her in the morning. Chris greeted us shortly after our arrival and was super friendly. We felt well taken care of and that we had everything we needed. Very cozy little cabin, close to amenities and all the essentials, yet very private. Please note a $20 fee is added to single night stays. The $50 deposit is non-refundable. If you cancel more than 24 hours before your stay, only the $50 deposit will apply. This can be applied to the cost of a future stay. If you cancel within 24 hours of the beginning of your stay, you will be charged a cancellation fee of one night stay ($135) or 50% of your total booking, whichever is greater. If your booking can be rebooked, we will refund 90% of the cancellation fee.